There’s a deeply-rooted ongoing relationship between movies and theme parks, one serving as inspiration for another and sometimes, the other way round. The Pirates of the Caribbean movie was inspired by the attraction with the same name, opened way back in 1967 at Adventureland in Disneyland Park in Anaheim, California. The runaway success of the movie spawned four sequels, with the latest being Dead Man Tells no Tales (2017). 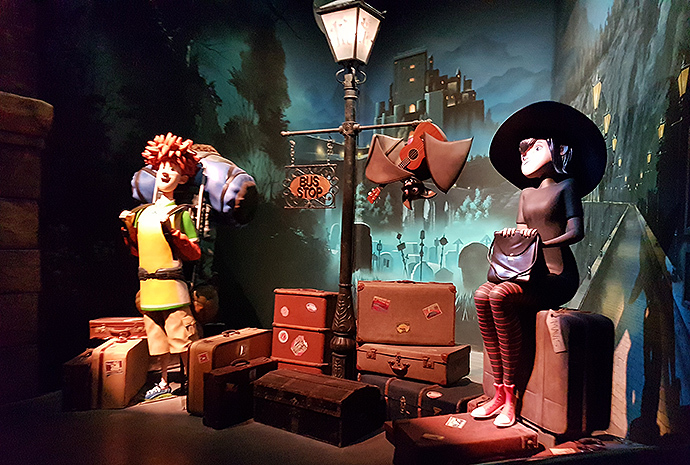 The movie franchise became such a hit that Disney actually refurbished this dark ride to include elements from the movie. Now, Jack Sparrow is an animatronic figure greeting guests in the dark waters of the boat ride. 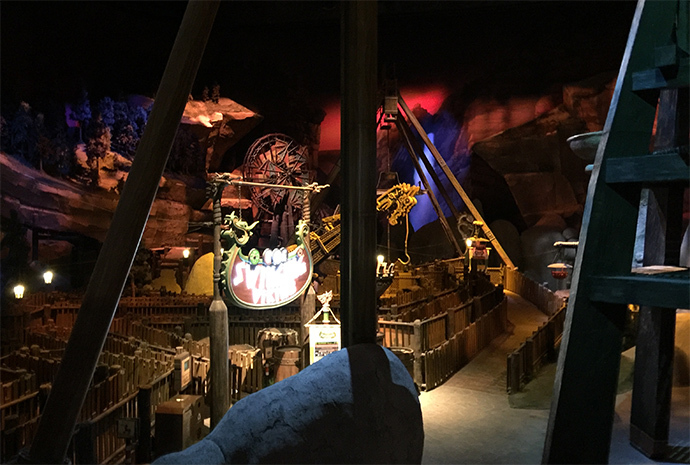 While this is the case of ride inspiring movie, which then inspired the ride, there are in fact, many movies that serve as inspiration for theme park attractions. In fact, the Universal Studios Theme Parks (there currently four, with three more in the works) are based solely on movie-inspired attractions, with their tagline being “Ride the Movies”. 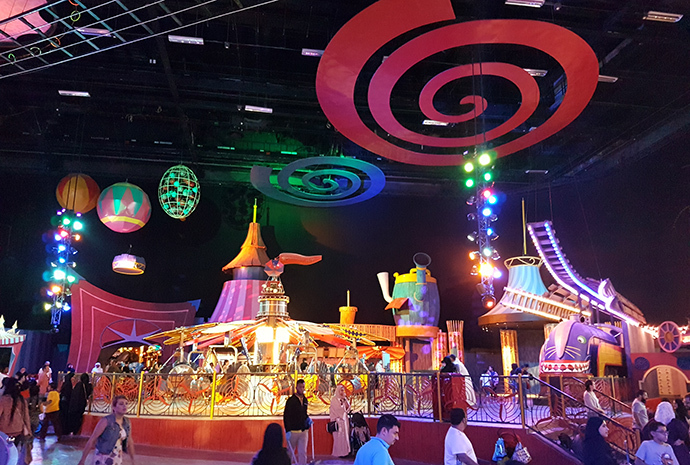 More recently, a Hollywood inspired theme park has sprung up in the Middle East; Motiongate Dubai is dedicated to bringing attractions based on popular movies to life. Here is a three-part series taking a look at the movies that inspired theme park attractions. 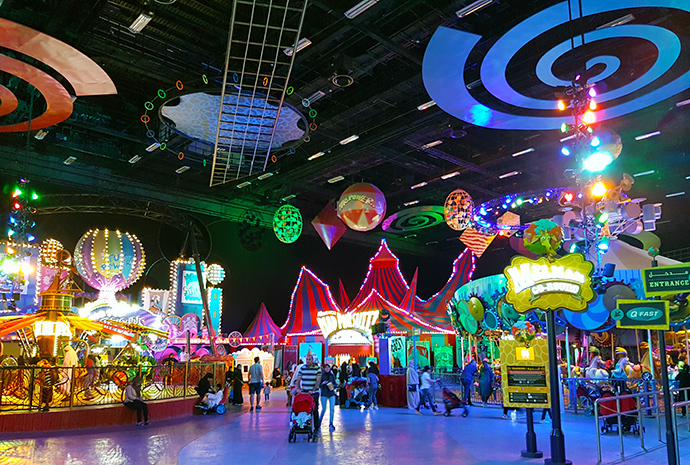 The first explores the relatively new MotionGate Dubai. 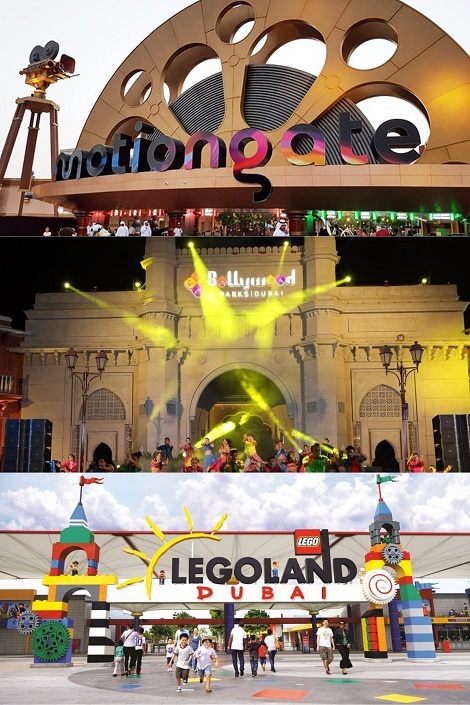 Part of the bigger Dubai Parks and Resorts that also offers Bollywood Parks and Legoland Dubai, Motiongate Dubai is solely dedicated to bringing movies to life. 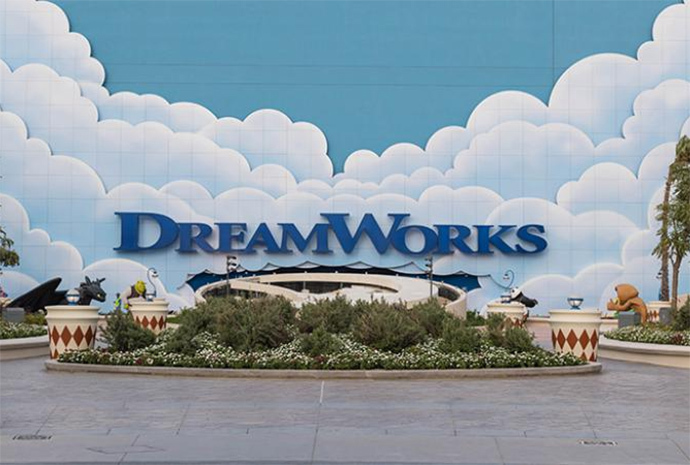 The park is divided into five areas- Studio Central, Columbia Pictures, Dreamworks, Smurfs Village and Lionsgate. 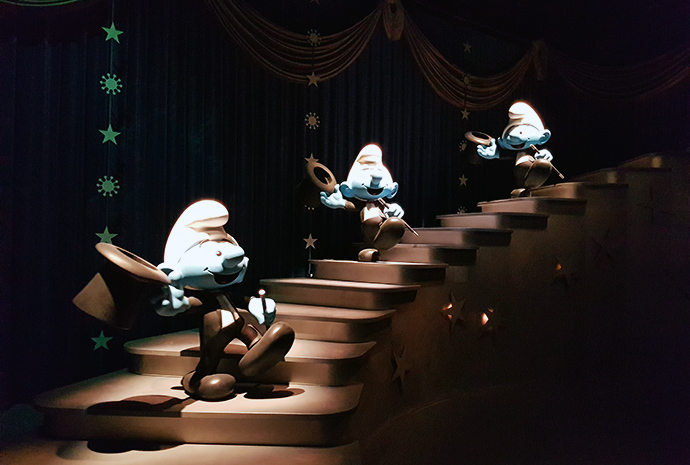 Out of the five areas, three are separated into major studios’ movie productions, while Smurfs Village transports you into the land of the adorable blue creatures. 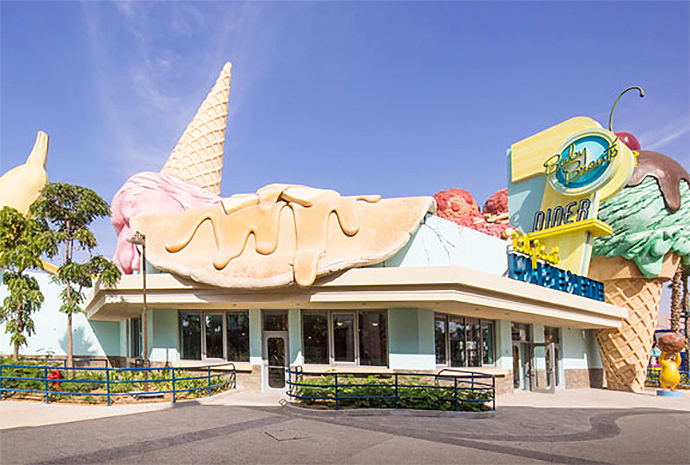 Studio Central isn’t a zone with attractions, but a thoroughfare of movie themed retail and dining outlets. 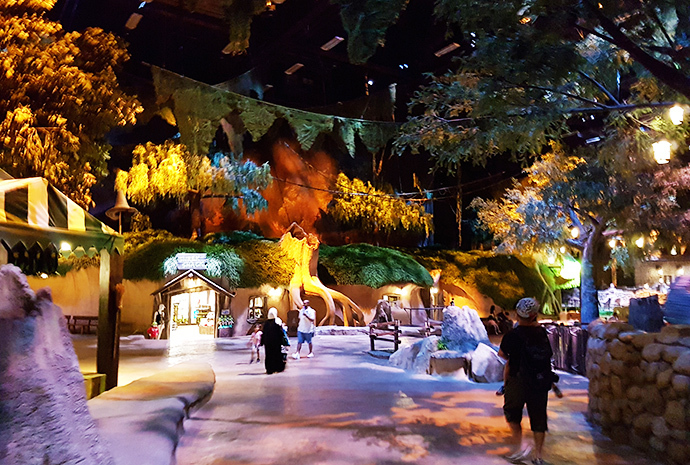 With Dubai known for its scorching weather, the Dreamworks land is in a welcoming indoor compound. 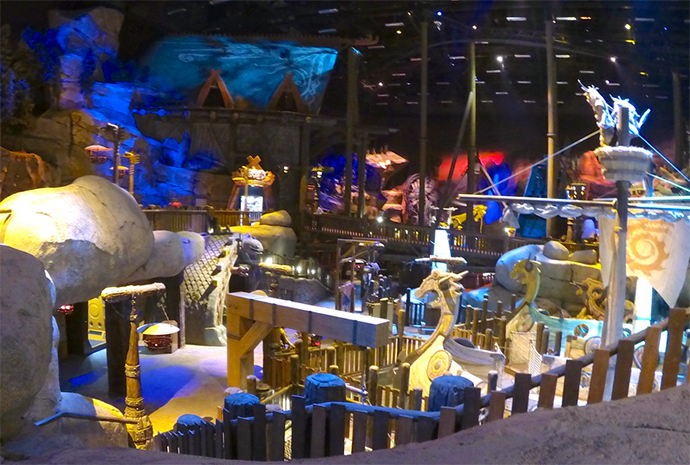 The theming of this land is jaw-droppingly incredible. 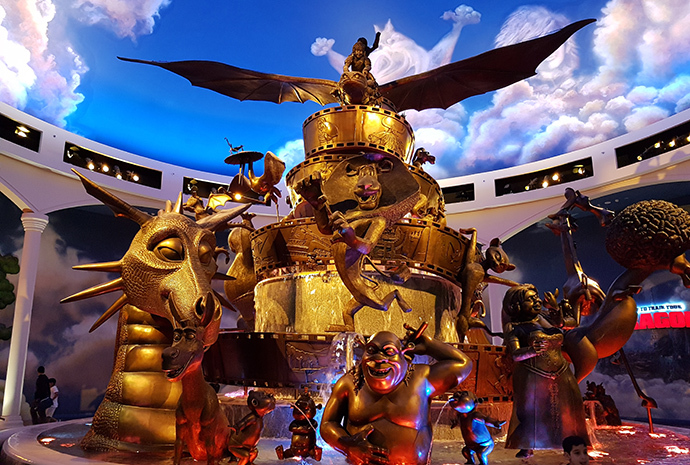 Once you enter, a golden fountain greets you, an elaborate artwork combining four popular Dreamworks Animation franchises of Shrek, Madagascar, Kungfu Panda, and How to Train Your Dragon. Behind the fountain are four entrances to the different themed areas with a collective 14 attractions. 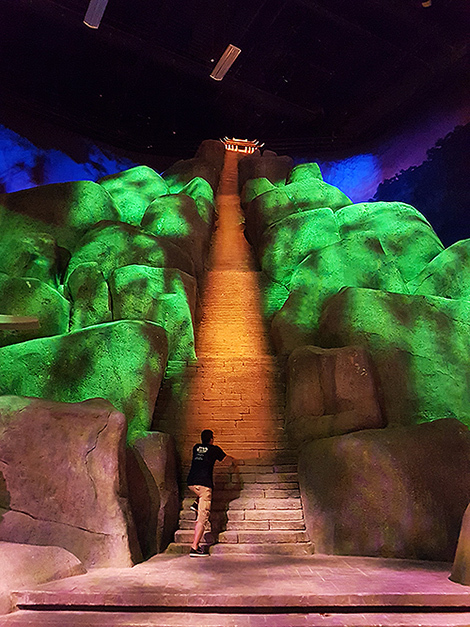 These attractions may not be enough to satisfy thrill-seekers, but their theming will send a feeling of awe and wonderment, especially for those who’ve seen these beloved movies onscreen. The extensive themed area is a re-creation of Shrek’s forest swamp home. It’s as though you’ve entered Shrek’s domain at twilight. There is a huge swamp celebration going on, and his gigantic swamp house is the main highlight. 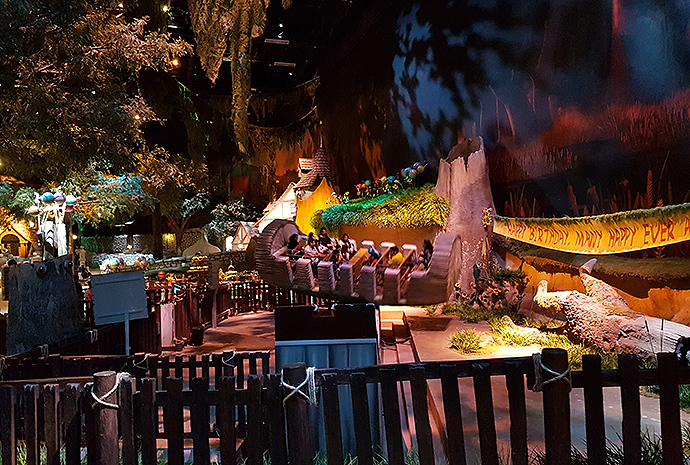 There are two main attractions here- the Swamp Celebration, a mini Viking ship ride in a log, and Shrek’s Merry Fairy Take Journey, a puppet show with Shrek and Fiona recounting the tale of how they met to their triplets, taking place in front of their tree house. 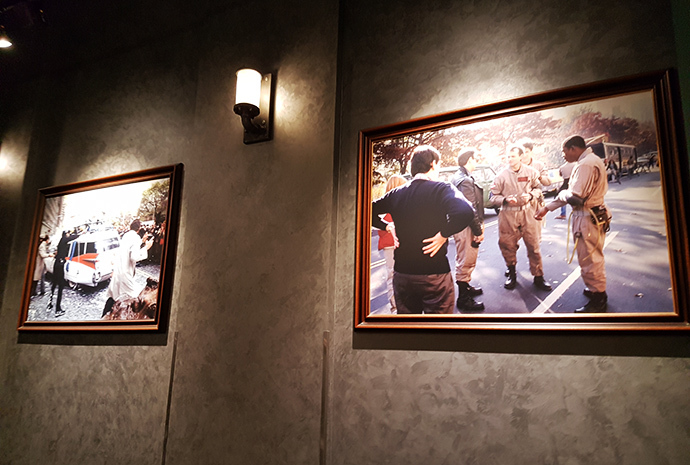 If you think the movie was a riot, this themed zone is even more rambunctious. It’s a crazy circus at Madagascar, with an explosion of colours splashed all over attractions like a merry-go-round, an air gliding ride that brings you around the zone and a roller coaster that sends you on a mad pursuit of the “wanted” Madagascar animals. Periodically, King Julien will make an appearance in all of his flamboyant glory and perform a number or two, and the adorable penguins will also showcase their infamous dancing skills while they try to outwit Captain Chantel DuBois, who’s out to capture them all. Visit the home village of Po the Kungfu Panda in the Valley of Peace. At one corner is Mr. Ping’s noodle shop, while at the other is the stairway leading up to the top of the Jade Mountain, where the Jade Palace is. 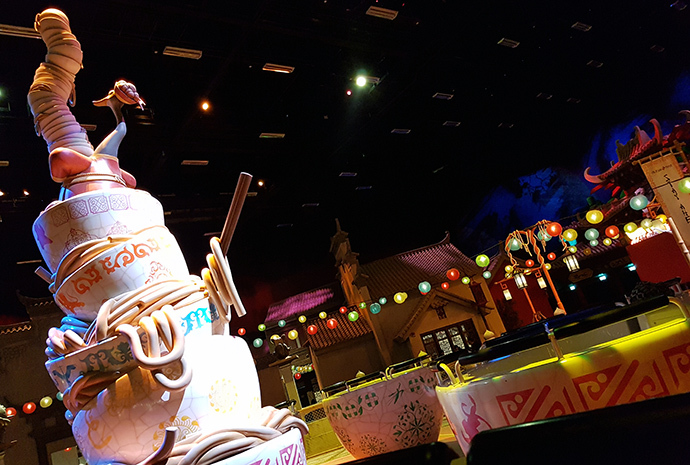 Then right at the centre is a festive-looking Mr. Ping Noodle Fling, a tea cup ride that spins you around, themed to noodles, or course. 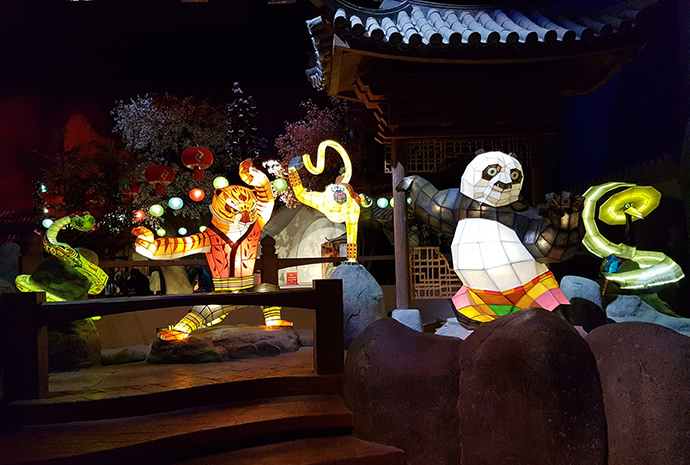 And just around the bend, you can enter a 4D simulator to see how the Dragon Warrior Po attempts to free the Furious 5 from a villainous warlord. Anywhere you walk around in the village, there are photo opportunities of the lovely facades of the village shops and houses faithfully re-created from the movie, as well as figures of Master Shifu, Grand Master Oogway and the warriors in Kungfu Panda. See the Viking world in How to Train Your Dragon spring to life in all its glory with the recreation of the quaint village of Berk. 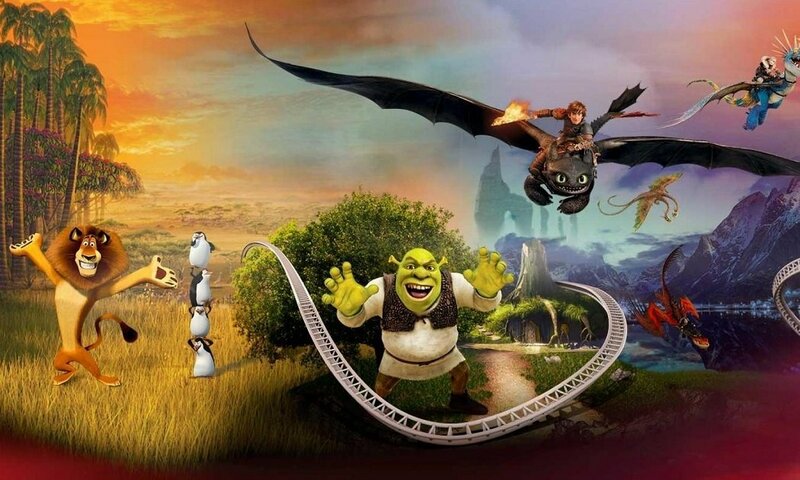 The highlight of this place is the Dragon Gliders, a suspended coaster ride that takes you on a flight with Hiccup and Toothless, soaring over the village and to the Forbidden Islands, and no Viking village would be complete without a Viking ship ride. 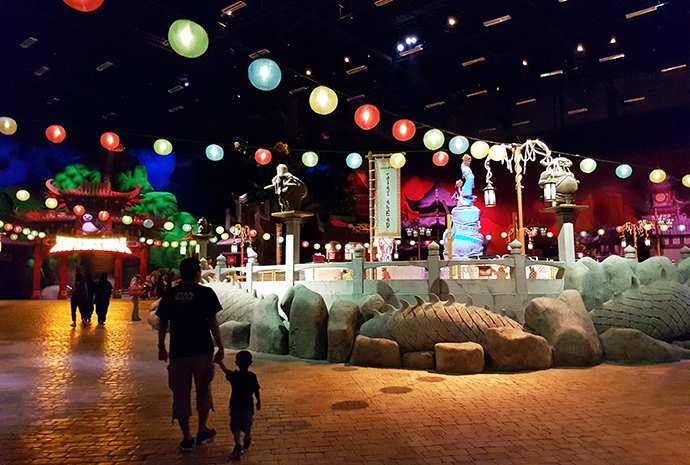 Tip: It’s easy to get lost in each of these themed areas once you enter. You may find yourself at a loss, with so many elements calling out to you. Because the areas are largely circular in nature, go on a clockwise direction, so you’d be focused and capture every element. Do you have to watch the movies before visiting? Those who’ve seen the movies would appreciate the attention paid to the theming of the area, which is what this Dreamworks land is all about. 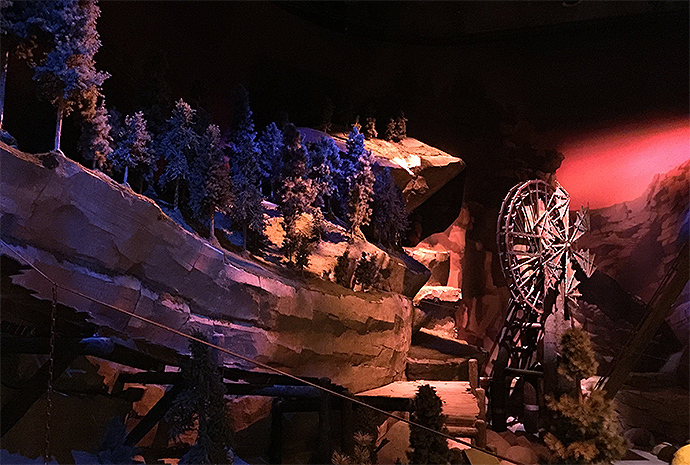 Granted, you’d still be amazed by the elaborate theming if you have not seen the movies, but seeing how these animated worlds are brought to life is pretty magical. To see the mushroom houses from the Smurfs Village come to life is a surreal affair. 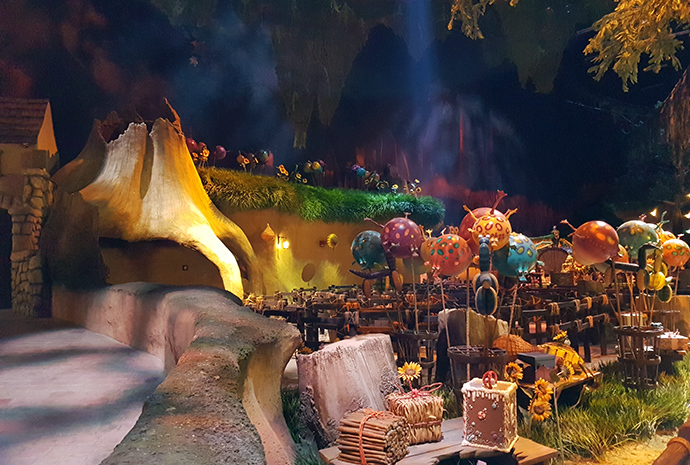 The Village is an area all by itself, and its inclusion seems out of place in this movie-themed park, but we’re not complaining, because who doesn’t like Smurfs? This place brings the kids much entertainment and brings out the kids in us. 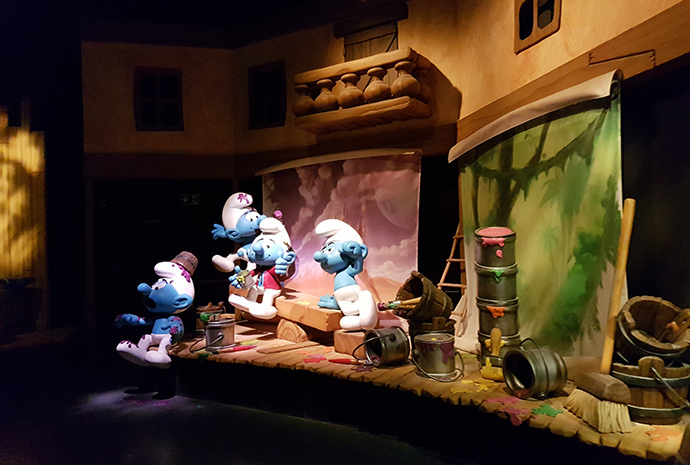 There’s a woodland area, essentially an outdoor playground where the little ones can run amok, an outdoor roller coaster ride that meanders around the village and a Smurf Studio Tour, where you get to know more about how these little blue creatures came about. There’s also a Smurfberry Factory, an interactive child play area where you gotta get the Smurfberries (which are made of colourful balls) under control. 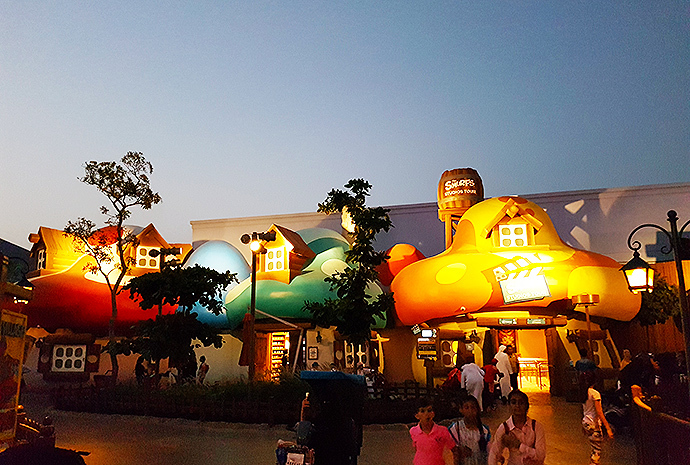 In all, the Smurfs Village is for families with young children to explore together. An interesting mix of movies are assembled in this zone, from indie film Zombieland, 80s classic Ghostbusters, to more contemporary animated film Hotel Transylvania and the popular Cloudy with a Chance of Meatballs. 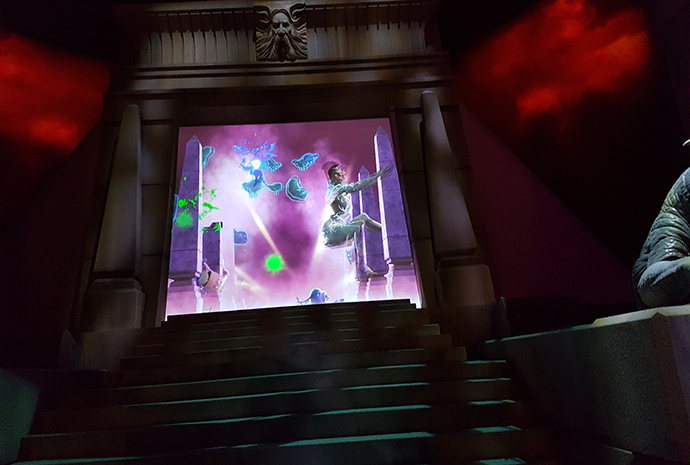 Unlike Dreamworks, the attractions in Columbia Pictures are first of all, outdoors, and secondly, not expansive themed areas but individual attractions. 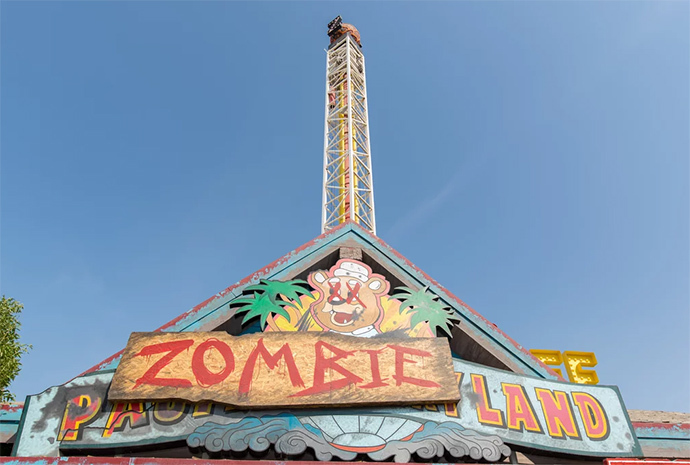 Zombieland, for instance, features the Zombieland Blast-off, a 58 meter drop tower attraction set in an area of an abandoned amusement park, just like in the movie, but there’s no extensive themed zone. 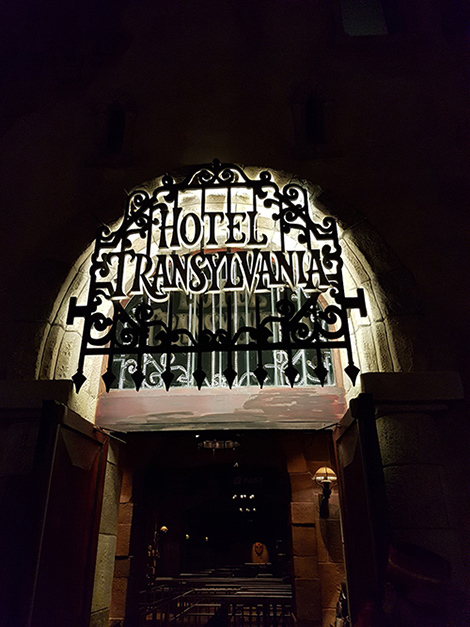 Hotel Transylvania features the hotel itself, and you’re taken on a tour around the hotel, encountering its very unusual guests and hosts in a coffin-like carriage ride. There’s also a Green Hornet Coaster, where you’re put on a “high speed chase” on Green Hornet’s signature ride, and sent on dizzying twists and lunging dips. 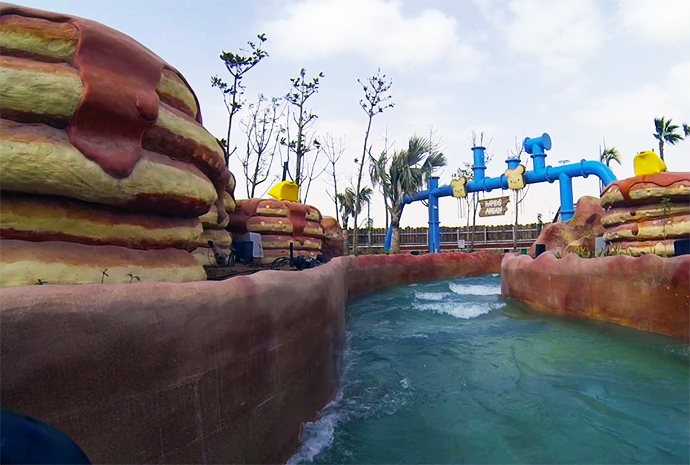 This is easily the most thrilling ride in the park, right alongside the Zombieland Blast-off. Other attractions in this zone include an Underworld 4D show, taking you through the 800-year old history between the lycans and the vampires. 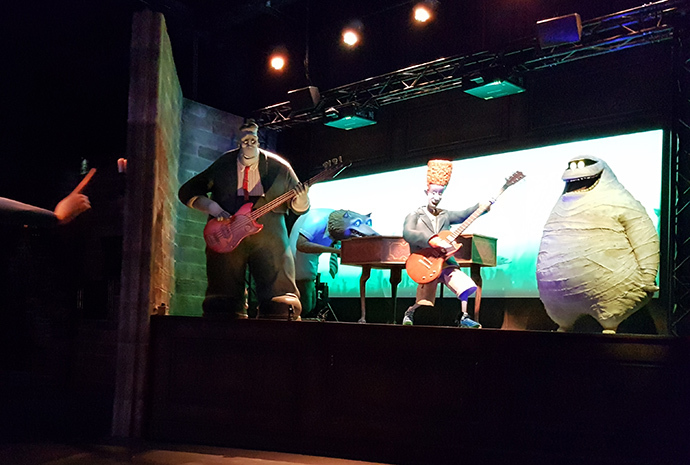 The theatre’s façade and décor set the mood, and the 4D effects are enough to send some chills down your spine. 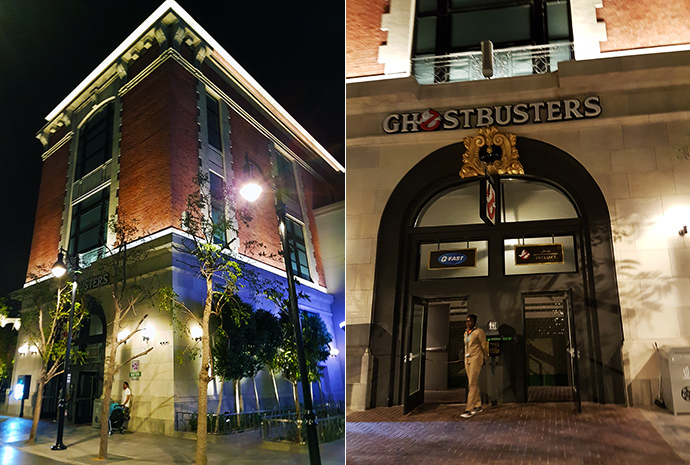 What was nostalgic in this zone is the Ghostbusters’ HQ building, a recreation of the fire station headquarters of the 1980s cult hit movie series. The façade resembles the one in the movie and once inside, you’re taken on a long queue line walk to the ride- the Ghostbusters Battle of New York, where you sit in carriages and blast at ghosts. 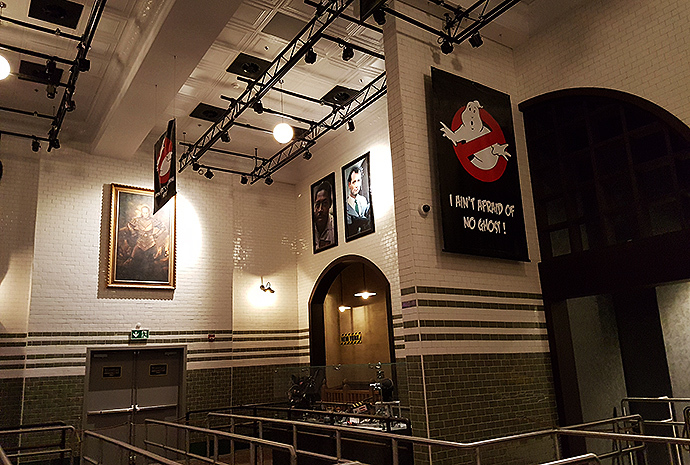 The queue line takes you through some excellent theming, with filing cabinets, paintings and closed doors with Ghostbusters elements on them. The ride itself was a bit of a let-down. The theming definitely overshadowed the tameness of the attraction. The attraction that stands out here is Cloudy with a Chance of Meatballs. 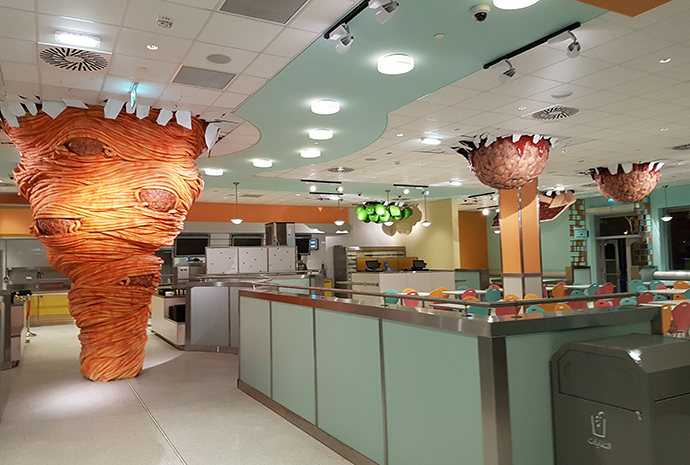 A small area covering an F&B outlet, a river expedition and an imagination lab (an indoors play area for kids), this animated movie strewn its gigantic meatballs, pizza and pasta all over the place and it was a sight to behold. On the river expedition, you’ll come across enormous hotdogs and other food items, with Flint at the side desperately trying to reel them in. 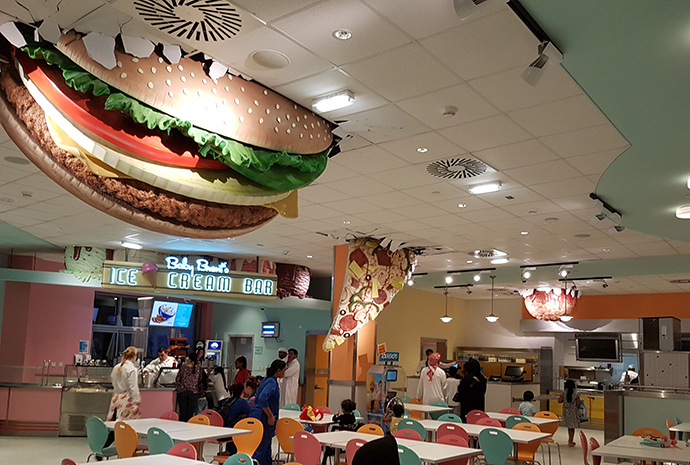 At the Baby Brent Luncheonette, huge pizza slices and burger cut through the roof, with a whirlwind of spaghetti and meatballs spiralling down the restaurant’s centre, making an incredible sight. It’s one thing to see giant food objects falling out from the sky and hitting the ground in the movie, but it’s quite another to see these enormous food items landing on roof tops in real life. The artwork and details are beautifully executed. Not for all, if you have not caught Green Hornet, you wouldn’t have missed anything. It would be nice if you’ve seen Cloudy with a Chance of Meatballs, Hotel Transylvania and Ghostbusters. You would definitely appreciate those massive slices of pizzas or the huge round meatballs much better. The carriage ride in Hotel Transylvania is a pretty long ride around the castle, and if you don’t know any of the characters, you might find the ride a tad boring. The Ghostbusters attraction façade is iconic, and if you have not seen the movie, it might be a tad boring for you. The last themed area here is Lionsgate, which is yet to open to the public. When operational, it will feature two rides on The Hunger Games film adaptation franchise and Step Up. 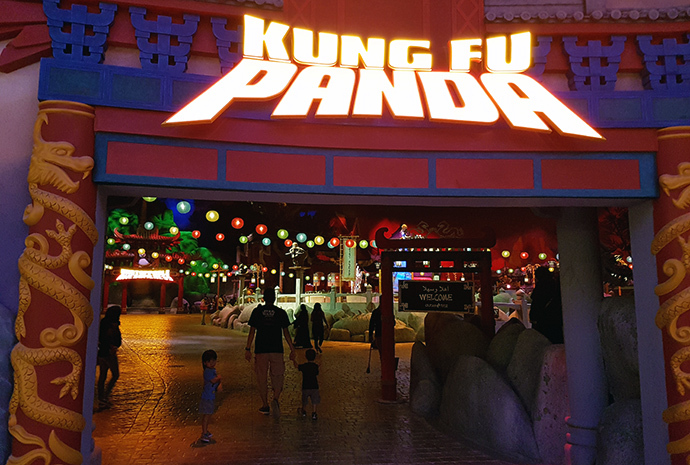 To be critical, it would seem Motiongate Dubai experiences a lack of identity in its collection of movie-themed attractions. 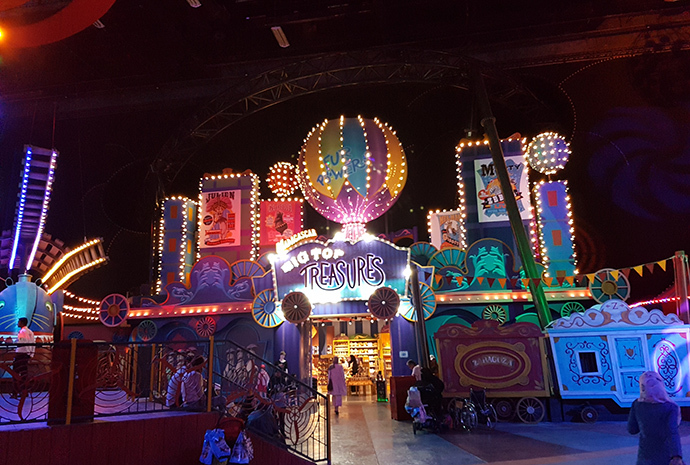 Its attractions may not satisfy the thriill-seekers yearning for excitement, but what it does have going for it is superb theming, which offers theme park enthusiats that immersive experience. Plus, many of its attractions based on movies you can’t find elsewhere (especially at the Columbia Pictures area). With The Hunger Games attraction yet to open, it might just be the anchor that the Park seeks.